If, as alleged, the Syrian regime has used chemical weapons, it would indeed be a serious development, constituting a breach of the Geneva Protocol of 1925, one of the world’s most important disarmament treaties, which banned the use of chemical weapons. In 1993, the international community came together to ratify the Chemical Weapons Convention, a binding international treaty that would also prohibit the development, production, acquisition, stockpiling, retention, and transfer or use of chemical weapons. Syria is one of only eight of the world’s 193 countries not party to the convention. However, U.S. policy regarding chemical weapons has been so inconsistent and politicized that the United States is in no position to take leadership in response to any use of such weaponry by Syria. The controversy over Syria’s chemical weapons stockpiles is not new. Both the Bush administration and Congress, in the 2003 Syria Accountability Act, raised the issue of Syria’s chemical weapons stockpiles, specifically Syria’s refusal to ratify the Chemical Weapons Convention. The failure of Syria to end its chemical weapons program was deemed sufficient grounds by a large bipartisan majority of Congress to impose strict sanctions on that country. Syria rejected such calls for unilateral disarmament on the grounds that it was not the only country in the region that had failed to sign the CWC—nor was it the first country in the region to develop chemical weapons, nor did it have the largest chemical weapons arsenal in the region. Indeed, neither Israel nor Egypt, the world’s two largest recipients of U.S. military aid, is a party to the convention either. Never has Congress or any administration of either party called on Israel or Egypt to disarm their chemical weapons arsenals, much less threatened sanctions for having failed to do so. U.S. policy, therefore, appears to be that while it is legitimate for its allies Israel and Egypt to refuse to ratify this important arms control convention, Syria needed to be singled out for punishment for its refusal. 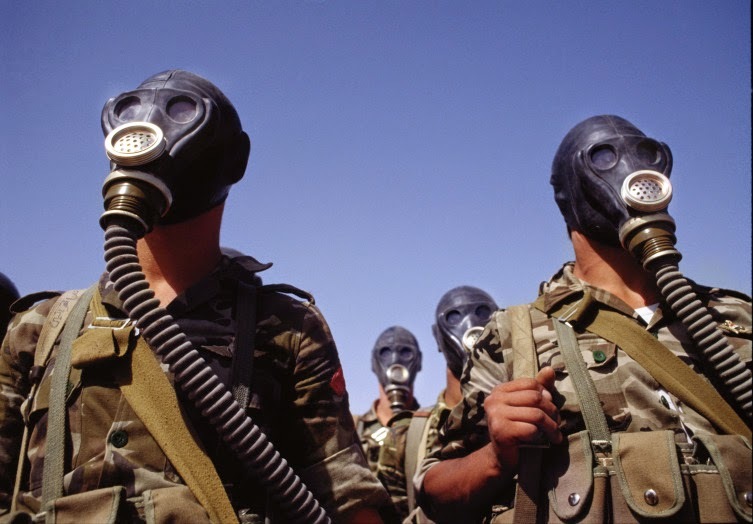 The first country in the Middle East to obtain and use chemical weapons was Egypt, which used phosgene and mustard gas in the mid-1960s during its intervention in Yemen’s civil war. There is no indication Egypt has ever destroyed any of its chemical agents or weapons. The U.S.-backed Mubarak regime continued its chemical weapons research and development program until its ouster in a popular uprising two years ago, and the program is believed to have continued subsequently. Israel is widely believed to have produced and stockpiled an extensive range of chemical weapons and is engaged in ongoing research and development of additional chemical weaponry. (Israel is also believed to maintain a sophisticated biological weapons program, which is widely thought to include anthrax and more advanced weaponized agents and other toxins, as well as a sizable nuclear weapons arsenal with sophisticated delivery systems.) For more than 45 years, the Syrians have witnessed successive U.S. administration provide massive amounts of armaments to a neighboring country with a vastly superior military capability which has invaded, occupied, and colonized Syria’s Golan province in the southwest. In 2007, the United States successfully pressured Israel to reject peace overtures from the Syrian government in which the Syrians offered to recognize Israel and agree to strict security guarantees in return for a complete Israeli withdrawal from occupied Syrian territory. The U.S. position that Syria must unilaterally give up its chemical weapons and missiles while allowing a powerful and hostile neighbor to maintain and expand its sizable arsenal of nuclear, chemical, and biological weapons is simply unreasonable. No country, whether autocratic or democratic, could be expected to accept such conditions. This is part of a longstanding pattern of hostility by the United States towards international efforts to eliminate chemical weapons through a universal disarmament regime. Instead, Washington uses the alleged threat from chemical weapons as an excuse to target specific countries whose governments are seen as hostile to U.S. political and economic interests. One of the most effective instruments for international arms control in recent years has been the Organization for the Prohibition of Chemical Weapons (OPCW), which enforces the Chemical Weapons Convention by inspecting laboratories, factories, and arsenals, and oversees the destruction of chemical weapons. The organization’s most successful director general, first elected in 1997, was the Brazilian diplomat Jose Bustani, praised by the Guardian newspaper as a “workaholic” who has “done more in the past five years to promote world peace than anyone.” Under his strong leadership, the number of signatories of the treaty grew from 87 to 145 nations, the fastest growth rate of any international organization in recent decades, and – during this same period – his inspectors oversaw the destruction of 2 million chemical weapons and two-thirds of the world’s chemical weapons facilities. Bustani was re-elected unanimously in May 2000 for a five-year term and was complimented by Secretary of State Colin Powell for his “very impressive” work. However, by 2002, the United States began raising objections to Bustani’s insistence that the OPCW inspect U.S. chemical weapons facilities with the same vigor it does for other signatories. More critically, the United States was concerned about Bustani’s efforts to get Iraq to sign the convention and open their facilities to surprise inspections as is done with other signatories. If Iraq did so, and the OPCW failed to locate evidence of chemical weapons that Washington claimed Saddam Hussein’s regime possessed, it would severely weaken American claims that Iraq was developing chemical weapons. U.S. efforts to remove Bustani by forcing a recall by the Brazilian government failed, as did a U.S.-sponsored vote of no confidence at the United Nations in March. That April, the United States began putting enormous pressure on some of the UN’s weaker countries to support its campaign to oust Bustani and threatened to withhold the United States’ financial contribution to the OPCW, which constituted more than 20 percent of its entire budget. Figuring it was better to get rid of its leader than risk the viability of the whole organization, a majority of nations, brought together in an unprecedented special session called by the United States, voted to remove Bustani. It was the Iraqi regime of Saddam Hussein, during the Iran-Iraq War in the 1980s, that used chemical weapons on a scale far greater than any country had dared since the weapons were banned nearly 90 years ago. The Iraqis inflicted close to 100,000 casualties among Iranian soldiers using banned chemical agents, resulting in 20,000 deaths and tens of thousands of long-term injuries. They were unable to do this alone, however. Despite ongoing Iraqi support for Abu Nidal and other terrorist groups during the 1980s, the Reagan administration removed Iraq from the State Department’s list of state sponsors of terrorism in order to provide the regime with thiodiglycol, a key component in the manufacture of mustard gas, and other chemical precursors for their weapons program. Walter Lang, a senior official with the U.S. Defense Intelligence Agency, noted how “the use of gas on the battlefield by the Iraqis was not a matter of deep strategic concern” to President Reagan and other administration officials since they “were desperate to make sure that Iraq did not lose.” Lang noted that the DIA believed Iraq’s use of chemical was “seen as inevitable in the Iraqi struggle for survival.” In fact, DIA personnel were dispatched to Baghdad during the war to provide Saddam Hussein’s regime with U.S. satellite data on the location of Iranian troop concentrations in the full knowledge that the Iraqis were using chemical weapons against them. Even the Iraqi regime’s use of chemical weapons against civilians was not seen as particularly problematic. The March 1988 massacre in the northern Iraqi city of Halabja, where Saddam’s forces murdered up to 5,000 Kurdish civilians with chemical weapons, was downplayed by the Reagan administration, with some officials even falsely claiming that Iran was actually responsible. The United States continued sending aid to Iraq even after the regime’s use of poison gas was confirmed. of Genocide Act to put pressure on the Iraqi regime, but the Bush administration successfully moved to have the measure killed. This came despite evidence emerging from UN reports in 1986 and 1987, prior to the Halabja tragedy, documenting Iraq’s use of chemical weapons against Kurdish civilians—allegations that were confirmed both by investigations from the CIA and from U.S. embassy staff who had visited Iraqi Kurdish refugees in Turkey. 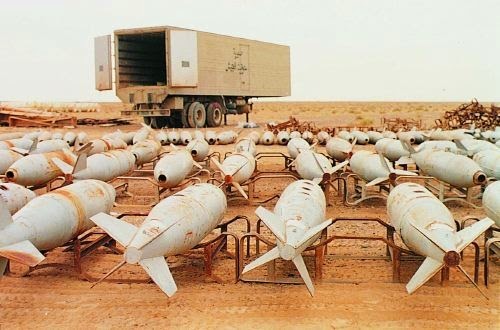 However, not only was the United States not particularly concerned about Iraq’s use of chemical weapons, the Reagan administration continued supporting the Iraqi government’s procurement effort of materials necessary for their development. Given the U.S. culpability in the deaths of tens of thousands of people by Iraqi chemical weapons less than 25 years ago, the growing calls for the United States to go to war with Syria in response to that regime’s alleged use of chemical weapons that killed a few dozen people leads even many of Syrian dictator Bashar Assad’s fiercest opponents to question U.S. motivations. This is not the only reason U.S. credibility on the issue of chemical weapons is questionable, however. After denying and covering up Iraq’s use of chemical weapons in the late 1980s, the U.S. government—first under President Bill Clinton and then under President George W. Bush—began insisting that Iraq’s alleged chemical weapons stockpile was a dire threat, even though the country had completely destroyed its stockpile by 1993 and completely dismantled its chemical weapons program. Vice President Joe Biden, Secretary of State John Kerry, and Secretary of Defense Chuck Hagel—when they served in the U.S. Senate in 2002—all voted to authorize the U.S. invasion of Iraq, insisting that Iraq still had a chemical weapons arsenal that was so extensive it constituted a serious threaten to the national security of the United States, despite the fact that Iraq had rid itself of all such weapons nearly a decade earlier. As a result, it is not unreasonable to question the accuracy of any claims they might make today in regard to Syria’s alleged use of chemical weapons. Engel is currently the chief sponsor of the Free Syria Act of 2013 (H.R. 1327), which would authorize the United States to provide arms to Syrian rebels. Unlike the case of Saddam Hussein’s Iraq, there are no UN Security Council resolutions specifically demanding that Syria unilaterally disarm its chemical weapons or dismantle its chemical weapons program. Syria is believed to have developed its chemical weapons program only after Israel first developed its chemical, biological, and nuclear programs, all of which still exist today and by which the Syrians still feel threatened. A case can be made, then, that had the United States pursued a policy that addressed the proliferation of non-conventional weapons through region-wide disarmament rather than trying to single out Syria, the Syrian regime would have rid itself of its chemical weapons some years earlier along with Israel and Egypt, and the government’s alleged use of such ordnance—which is now propelling the United States to increase its involvement in that country’s civil war—would have never become an issue. This was originally published at Foreign Policy in Focus. New York attorney Jeanne Mirer is president of the IADL and co-chair of the NLG’s International Committee. The Obama administration will reportedly launch a military strike to punish Syria’s Assad government for its alleged use of chemical weapons. A military attack would invariably kill civilians for the ostensible purpose of showing the Syrian government that killing civilians is wrong. “What we are talking about here is a potential response… to this specific violation of international norms,” declared White House press secretary Jay Carney. But a military intervention by the United States in Syria to punish the government would violate international law. For the United States to threaten to and/or launch a military strike as a reprisal is a blatant violation of the United Nations Charter. The Charter requires countries to settle their international disputes peacefully. Article 2(4) makes it illegal for any country to either use force or threaten to use force against another country. Article 2(7) prohibits intervention in an internal or domestic dispute in another country. The only time military force is lawful under the Charter is when the Security Council approves it, or under Article 51, which allows a country to defend itself if attacked. “The use of chemical weapons within Syria is not an armed attack on the United States,” according to Notre Dame law professor Mary Ellen O’Connell. The United States and the international community have failed to take constructive steps to promote peace-making efforts, which could have brought the crisis in Syria to an end. The big powers instead have waged a proxy war to give their “side” a stronger hand in future negotiations, evaluating the situation only in terms of geopolitical concerns. The result has been to once again demonstrate that military solutions to political and economic problems are no solution at all. Despite U.S. claims of “little doubt that Assad used these weapons,” there is significant doubt among the international community about which side employed chemical weapons. Many view the so-called ‘rebels’ as trying to create a situation to provoke U.S. intervention against Assad. Indeed, in May, Carla del Ponte, former international prosecutor and current UN commissioner on Syria, concluded that opposition forces used sarin gas against civilians. The use of any type of chemical weapon by any party would constitute a war crime. Chemical weapons that kill and maim people are illegal and their use violates the laws of war. The illegality of chemical and poisoned weapons was first established by the Hague regulations of 1899 and Hague Convention of 1907. It was reiterated in the Geneva Convention of 1925 and the Chemical Weapons Convention. “poison or poisoned weapons” and “asphyxiating, poisonous or other gases, and all analogous liquids, materials or devices” are war crimes, under Article 8. The prohibition on the use of these weapons is an international norm regardless of whether any convention has been ratified. As these weapons do not distinguish between military combatants and civilians, they violate the principle of distinction and the ban on weapons which cause unnecessary suffering and death contained in the Hague Convention. Under the Nuremberg Principles, violations of the laws of war are war crimes. The self-righteousness of the United States about the alleged use of chemical weapons by Assad is hypocritical. The United States used napalm and employed massive amounts of chemical weapons in the form of Agent Orange in Vietnam, which continues to affect countless people over many generations. “In contrast to today’s wrenching debate over whether the United States should intervene to stop alleged chemical weapons attacks by the Syrian government, the United States applied a cold calculus three decades ago to Hussein’s widespread use of chemical weapons against his enemies and his own people. § Cluster bomb cannisters contain tiny bomblets, which can spread over a vast area. Unexploded cluster bombs are frequently picked up by children and explode, resulting in serious injury or death. § Depleted uranium (DU) weapons spread high levels of radiation over vast areas of land. In Iraq, there has been a sharp increase in Leukemia and birth defects, probably due to DU. § White phosphorous gas melts the skin and burns to the bone. The Geneva Convention Relative to the Protection of Civilian Persons in time of War (Geneva IV) classifies “willfully causing great suffering or serious injury to body or health” as a grave breach, which constitutes a war crime. The use of chemical weapons, regardless of the purpose, is atrocious, no matter the feigned justification. …and other toxic chemicals and metals such as TNT and mercury. This occurred within a couple of miles of a civilian population that included thousands of U.S. citizens. The people of Vieques have lived under the colonial rule of the United States now for 115 years and suffer from terminal health conditions such as elevated rates of cancer, hypertension, respiratory and skin illnesses and kidney failure. While Secretary Kerry calls for accountability by the Assad government, the U.S. Navy has yet to admit, much less seek atonement, for decades of bombing and biochemical warfare on Vieques. The U.S. government’s moral outrage at the use of these weapons falls flat as it refuses to take responsibility for its own violations. “NATO air war in Kosovo as a possible blueprint for acting without a mandate from the United Nations,” the New York Times reported. But NATO’s Kosovo bombing also violated the UN Charter as the Security Council never approved it, and it was not carried out in self-defense. The UN Charter does not permit the use of military force for “humanitarian interventions.” Humanitarian concerns do not constitute self-defense. In fact, humanitarian concerns should spur the international community to seek peace and end the suffering, not increase military attacks, which could endanger peace in the entire region. “Does anyone really believe that a military strike on an alleged chemical weapons factory would help the Syrian people, would save any lives, would help bring an end to this horrific civil war”? Military strikes will likely result in the escalation of Syria’s civil war. The United States and its allies must refrain from military intervention in Syria and take affirmative steps to promote a durable ceasefire and a political solution consistent with international law. If the U.S. government were truly interested in fomenting peace and promoting accountability, it should apologize to and compensate the victims of its own use of chemical weapons around the world.